It’s evident that I was born to live for the summer, there’s nothing like feeling the warmth of the sun on your skin after a cold winter and being able to go outside without having to wear layer upon layer. It seems like the summer is finally here and I’m trying to make the most of soaking up the sun when I can, you can’t begin to believe how hard it is when you work in an office 9:00-5:30 Monday-Friday. But it’s always a treat to be able to enjoy longer and lighter evenings like this when you can go out in shorts and a top without feeling cold. On Wednesday night I headed to the Royal William Yard in Plymouth for a delicious evening of drinks and nibbles at Wildwood Restaurant (more about that in another post!). As the location is one of my top choices to head to in Plymouth I couldn’t pass up a chance to get some outfit shots when the light was just right and I could admire the sunset from a distance too. There’s something so therapeutic about watching the sun go down, I wish I could bottle that ‘calm’ feeling for a lifetime. 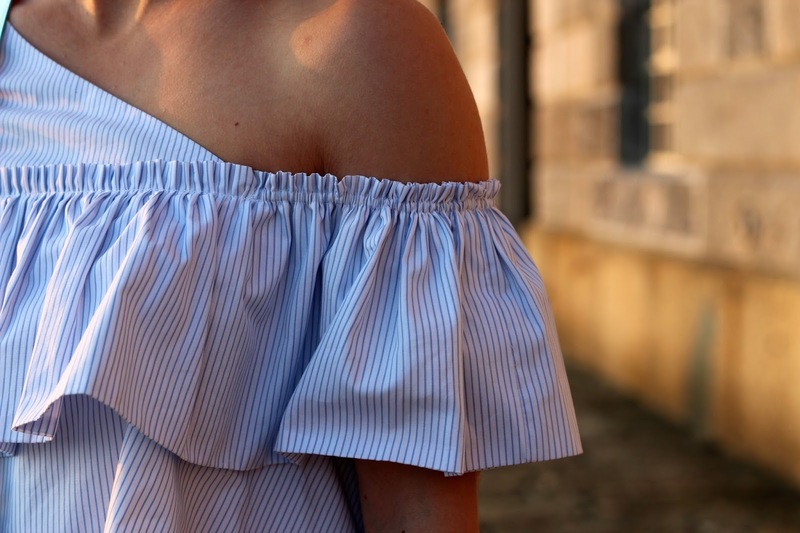 I wore my favourite new Zara off the shoulder number for the occasion, frills, off the shoulder, blue and white stripes, could it be any better? If you like off the shoulder tops then you’re going to love Zara this season, their collection is so on point! 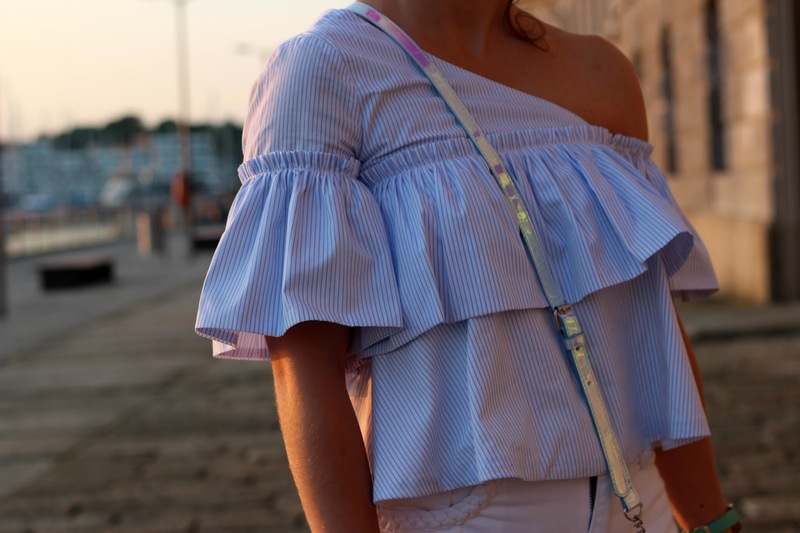 I teamed it with my new Primark shorts which were a bargain, white shorts are such a classic staple for summer wear, as they literally go with everything. 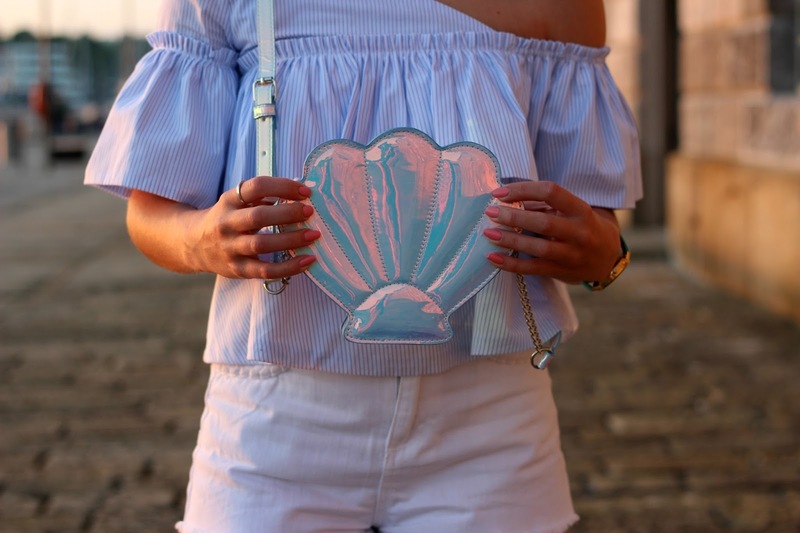 Yes, it is another novelty bag… I just can’t help myself where they’re concerned, this is an almost identical dupe to the Skinny Dip London shell bag too, for only £9 I know which one I preferred! What do you think of this outfit? Which season is your favourite? Do you like watching the sunset?